Ancient Egypt was divided into two kingdoms about 3100 BC: Upper and Lower Egypt which were unified into a single kingdom by Menes about 3000 BC. According to Egyptian priest Manetho who lived in the 3rd century BC the 1st dynasty starts with Menes who made Memphis the capital of unified Egypt. Manetho and some other sources also record that Upper and Lower Egypt were politically unified in a form of a double kingdom already before Menes several times. However, unifications of Upper and Lower Egypt in Predynastic Period were short lived and under Menes began the final phase of merging of Egyptian lands into a single centralized monarchy. Menes is widely considered the first unifier of Egypt but it remains uncertain whether he was real or mythological figure, while some scholars believe that Menes is actually King Narmer. 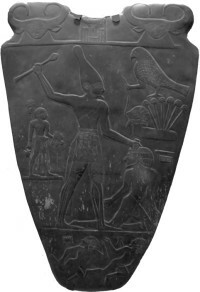 The theory that Menes and Narmer are one and the same person bases on the Narmer Palette or the Palette of Narmer which dates from the 31st century BC and according to some Egyptologists depicts unification of Egypt under King Narmer. Ancient Egypt during the Early Dynastic Period was divided into 42 administrative regions called nomes ruled by nomarchs whose position was hereditary. Egyptian pharaohs had an absolute power and were both secular and religious rulers. They were considered reincarnations of god Horus in life, viewed as divine and worshiped like gods. The Early Dynastic Period was also marked by the development of hieroglyphic writing which was deciphered after the discovery of the Rosetta Stone in 1799. The Early Dynastic Period is often considered a prelude to the great era of the Old Kingdom not only because of the centralized state organization, established tax collection system, taking census, official year numbering, etc. but also because of emergence of polytheistic Egyptian religion, mythology and theology as well as because of development of sophisticated art and crafts which resemble the later Egyptian art forms. Egyptians in the Early Dynastic Period also show tensions towards countries which came under Egyptian influence such as Nubia and Libya in later period, while military expeditions were even led to the coast of the Red Sea. Under last pharaohs of the 1st dynasty broke out struggles over the throne, while the rule of last pharaohs of the 2nd dynasty was characterized by political and religious conflicts which even threatened the integrity of Egypt. However, the last pharaoh of the 2nd dynasty Khasekhemwy (d. 2686) managed to end the civil war.